Scan the horizon for the “big five” and spend time in the wild with a conservationist from the National Geographic Big Cats Initiative. Explore your wild side on this 10-day adventure! Visit Kirstenbosch National Botanical Garden with an expert guide on a tour exclusively designed for our groups – the garden has been named one of the top gardens in the world by National Geographic Traveler magazine. Continue on to explore vibrant Cape Town and Cape Point, with a visit to the penguins at Boulders Beach. Enjoy a day of leisure and choose from a variety of optional activities, including Table Mountain or a Stellenbosch wine tour. Enjoy a full day scenic drive along the famed Panorama Route with stops at Blyde River Canyon, Bourke's Luck Potholes, and God's Window. Continue to our tented camp located just outside Kruger National Park and this evening enjoy a delicious South African dinner on the deck or in the boma. Enjoy a morning wildlife safari drive through Kruger National Park in an open vehicle. Take in views of the abundant wildlife including elephants, lions and giraffe. Afterwards, opt to take an afternoon safari drive, wildlife bush walk, or relax on the deck with views of the watering hole - a popular spot for animals to visit. 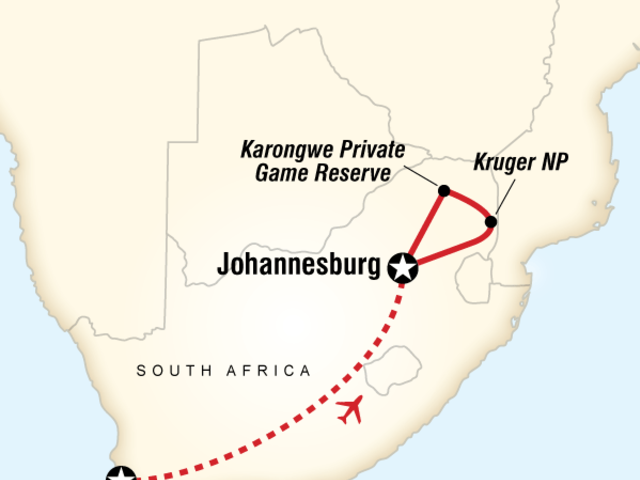 Continue on to a private nature reserve in the Greater Kruger area. This afternoon, take in a lecture with a researcher from the Endangered Wildlife Trust’s Cheetah Metapopulation Project who will share information about their efforts to protect cheetahs and other carnivores. This National Geographic-sponsored project is part of the Big Cats Initiative. After, the researcher will join us on our evening wildlife safari drive. Enjoy early morning and afternoon safari drives with our local guides, searching for buffaloes, elephants, leopards, lions, and rhinos – Africa's famed Big Five. In our down time, relax at the camp, take a walk around the grounds or enjoy a cool drink on the deck. After one last safari wildlife safari drive, head back to the city. In the evening, enjoy dinner at our local guest house. Comfort hotel (3 nts), guest house (2 nts), comfortable safari camps (4 nts). Allow USD205-270 for meals not included. Private van, plane, air-conditioned touring vehicle, open safari vehicle, walking. Chief Experience Officer (CEO) & driver for Kruger portion, local CEO in Cape Town, local guides/rangers. Contact your UNIGLOBE Travel Consultant today for an adventure of a lifetime!